By now the Kunsthal has acquired years of experience in actively involving the public in its exhibition programme. Various forms of public participation were organised in 2015 too without being afraid to experiment. 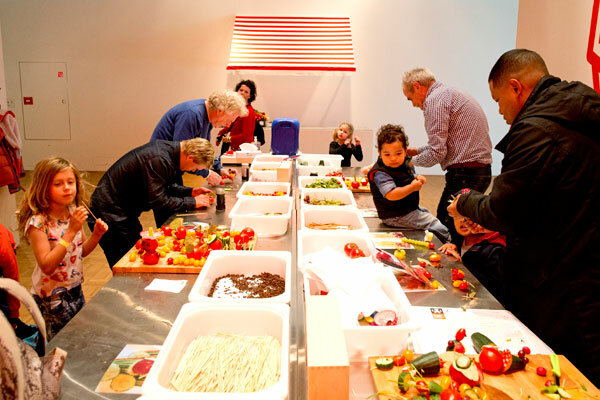 In the summer exhibition ‘Tomato Factory (part of the KunsthalCooks & cultivates Festival) , people of all ages could discover for themselves how tomatoes grow, what you can do with them, and what goes on before a tomato arrives on the supermarket shelf. Visitors followed the whole cultivation process from seed to plant by following an interactive route. They could cultivate tomatoes themselves and make their own tomato soup or sugar-free ketchup from the harvest, including a label for the packaging. At the end the taste of the connoisseur was tested blindfold on the most diverse kinds of tomato in collaboration with Rijk Zwaan from Wageningen University. The visitors were the protagonists in the exhibition do it (Kunsthal Rotterdam). 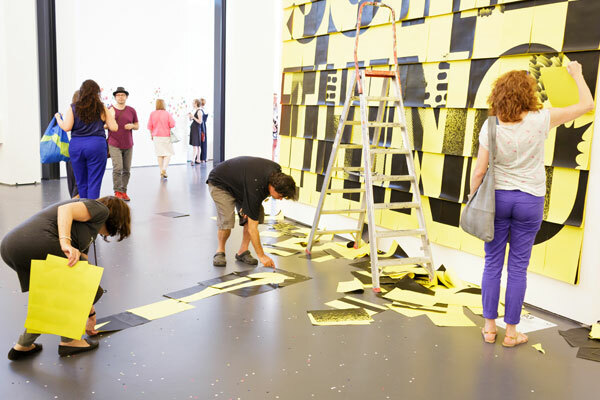 The name says it: Do It Yourself– genuine public participation because an active role of the visitors was essential for the creation of several of the many works of art. The Kunsthal invited everyone to put all their energy into do it (Kunsthal Rotterdam). During the special opening event on Saturday 4 July, the guests took part in the do it instruction of Amalia Pica’s ‘Organise a party’, in which 200 kg of confetti were launched into the air at the same moment. Various do it instructions invited the visitors to take part actively, such as ‘When you are walking, stop and smile at a stranger’ by Louise Bourgeois (2002), ‘WISH PEACE’ by Yoko Ono (1996), ‘Instruction’ by Joan Jonas (2012) and ‘A Black but not Straight Line’ by Sol Lewitt (2001). The Keith Haring Community Art Project ‘Art is for Everyone’ is a good example of public participation in the spirit of Keith Haring. He regarded art as a public right and public property. That is why Haring often worked in the public space and organised various community art projects to involve a large public in his art. Prior to the opening of the exhibition ‘Keith Haring. The Political Line’, the Kunsthal invited graphic designers, artists, muralists, illustrators, street artists, designers and cartoonists to draw inspiration from the artist Keith Haring and from the title of the exhibition ‘The Political Line’. More than 55 submissions were assessed by the jury: Julia Gruen, director of the Keith Haring Foundation in New York, artists Jan Rothuizen and Piet Parra, and Kunsthal director Emily Ansenk. The designs of the three prize-winning artists and illustrators were implemented. 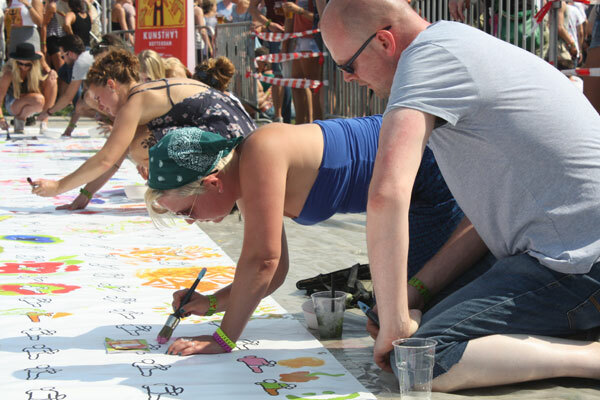 Their creations were painted by passers-by and visitors on a canvas several metres long during Lowlands in August, 24 uur cultuur in the Rotterdam Central Station in September, and during the Keith Haring Weekend in the Museumpark Rotterdam in October.